Beautifully engraved certificate from the Byron Jackson Company issued in 1936. 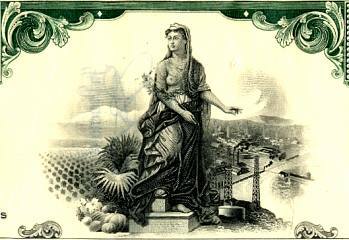 This historic document was printed by Jeffries Bank Note Company and has an ornate border around it with a vignette of an allegorical woman standing next to an oil field and farm. This item has printed signatures by the Company's President ( E. S. Dulin ) and Secretary and is over 69 years old. 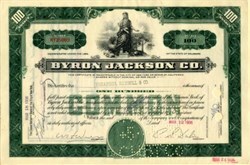 � In 1872, 31-year old inventor Byron Jackson formed the Byron Jackson Company. His labor-saving inventions included the Jackson Feeder, and many feel he would have ranked among noted inventors like John Deere or Cyrus McCormick had he not turned his main interest to pumps. � The Byron Jackson Company moved to San Francisco in 1879 where the Company�s engineers developed the first deep-well turbine pump and the original submersible pump. � In 1906, the Great San Francisco earthquake completely destroyed the Byron Jackson Machine Works. Jackson rebuilt his factory, then helped design a modern fire protection system for the city, including the first fire trucks and boats equipped with powerful, high-pressure centrifugal pumps. � When he retired in 1913, Byron Jackson's name was synonymous with excellence and innovation. � During the 1929 stock market crash, Byron Jackson Company acquired Dunn Manufacturing Company and several other oil tool manufacturers to establish the Byron Jackson Oil Tool Division. � Driven to keep up with the great oil strikes in the Mid-Continent and the Permian Basin regions, Byron Jackson Company built an oil tool manufacturing plant in Houston, Texas, in 1938. � In 1955, Borg-Warner acquired the Byron Jackson Company making it part of one of the nation's largest and most research-oriented industrial complexes. At the time of its acquisition by Borg-Warner, Byron Jackson was a well established public company engaged in three distinct business � (1) the manufacture of centrifugal and turbine pumps, (2) the manufacture of oil field pipe handling tools and equipment and (3) the delivery of a range of oil field cementing and perforating services. These distinct businesses were conducted through three separate divisions of Byron Jackson. � In 1974, Borg Warner sold the oil field equipmentand tools and well services businesses of Byron Jackson to Hughes Tool Company (which later merged with Baker Oil Tools to become Baker Hughes). The remaining business division, the industrial pump business, remained with Borg-Warner. Industrial pumps carrying the Byron Jackson name and tools and equipment carrying the Byron Jackson logo are still offered by the successors to Borg-Warner.